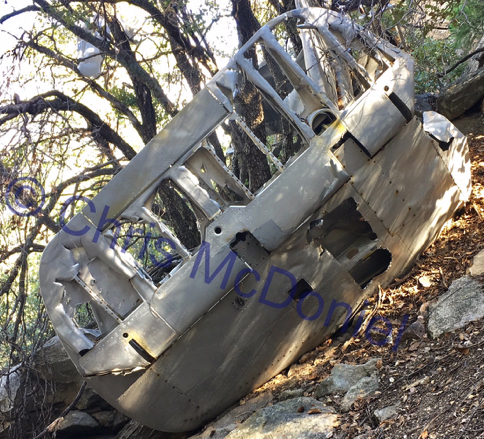 Ten days after the crash, the missing B-25 was finally located in a steep canyon of the Rincon Mountains by a member of the Civil Air Patrol (CAP). The B-25 crashed in a snow storm on January 20, 1945. Snow buried the debris for days until a low flying member of the CAP spotted the wreckage. At one time, this was a great site to visit. Like so many sites, this one has been picked apart over the years. The color photos were take in the late 1980s. 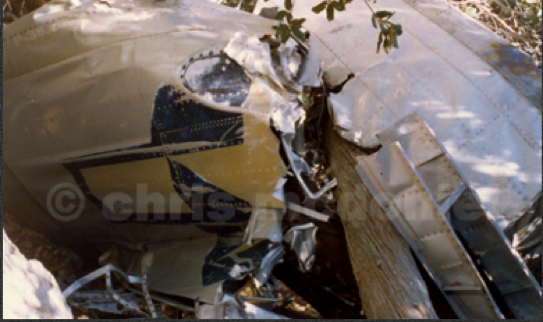 The black and white photos are from the Army Air Forces mishap report. 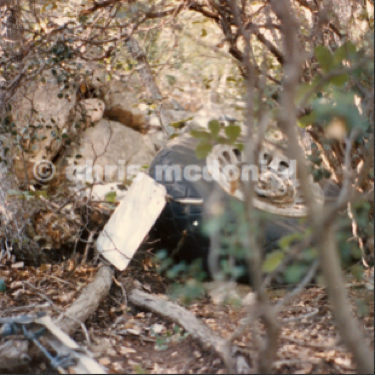 A special thank you to Mr. Larry Tagg for sharing his research information and helping me locate this crash site back in the 1980’s. One of the B-25's rudders, photo taken in the late 1980's. 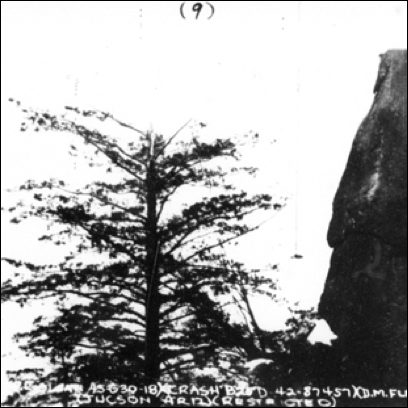 Mishap report photo showing tree that was clipped by B-25. On the right, is part of the rock face the B-25 flew into during a snow storm. 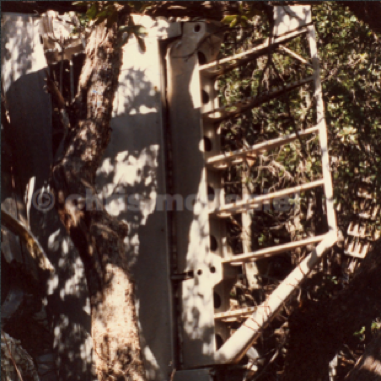 Control surface under a canopy of trees, photo taken in late 1980's. Tire (still inflated), photo taken in the late 1980's. 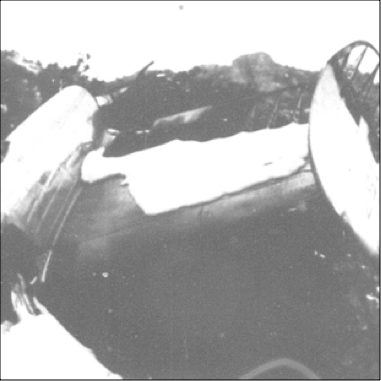 Photo from the mishap report. 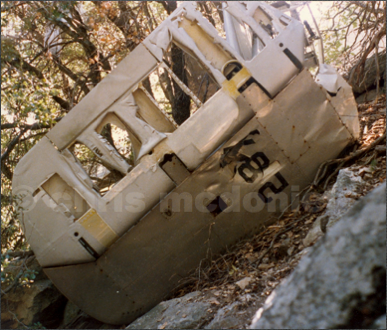 Wing with, insignia still visible, in this photo taken in late 1980's. Portion of the tree still remain in the wing. Same rudder in 2016. Fabric starting to wear off and the serial number was removed. Insignia a little faded, but still visible in 2016. 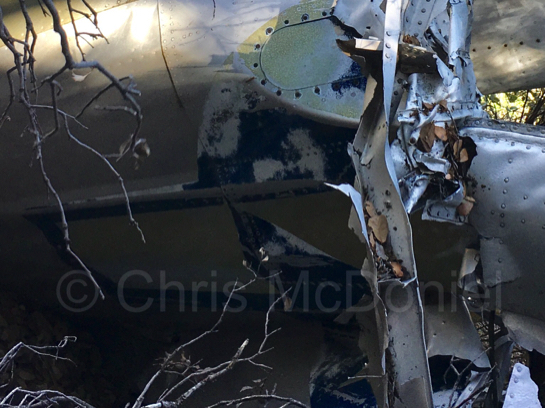 One of the radial engines with a tree growing around it.